Will Conservatives Give Russia a Pass? We’re approaching the final days in Virginia’s gubernatorial race and there’s another poll out that shows that Republican Ed Gillespie has not only surged, but is ahead of Democratic Lt. Gov. Ralph Northam by eight points. The poll was taken by Hampton University, with a sample size of 750 people between October 18 and 22. It had Gillespie leading 41-33 over Northam, with 27 percent undecided. The Real Clear Politics average still has Northam up around six points, with Northam also leading Gillespie by seven points in another poll by Fox News. Also, that’s a lot of undecided voters. I think there’s a good chance that the Democrats can absolutely blow this election in which the progressive and establishment wings of the Democratic Party would go at each other again; something that’s always popcorn-worthy entertainment. It should thrust the whole party in panic mode for the 2018 midterms, as the path to Gillespie’s victory is a surge in the rural counties, a sign that Democrats have yet to truly reach out to voters who don’t like in the cities. It’s not hard. Democrats did this under Obama and had great success, though they seem hesitant to do so post-2016. A good chunk of Trump voters are not typical Republican voters, many have economically progressive views. They’re shiftable. The mistake Hillary Clinton made was thinking the Trump coalition was your typical GOP base. Not true. The rural voter collapse could also mean that more punishment is in store for Democrats in Montana, North Dakota, and Missouri, which will have red state Democrats fighting for their political lives next year. And those states are much more Republican than Virginia. But regardless of whether Northam wins, I’d urge you not to read too much into Virginia’s governor’s race. State politics are different from national politics. Even if Northam isn’t raking in cash hand over fist, he has still outraised Gillespie and pulled in nearly three times as many donations of less than $100 as the Republican. More than that, gubernatorial elections — especially in Virginia — don’t necessarily reflect the national mood. In 2009, for example, Republican Bob McDonnell’s landslide victory over Democrat Creigh Deeds accurately presaged Republicans taking over the House in 2010, though the national House margin ended up being much smaller. Four years later, however, Democrat Terry McAuliffe’s win over Republican Ken Cuccinelli gave Democrats false hope ahead of the 2014 midterms, in which they lost control of the Senate. The 2001 Virginia governor election was similarly misleading: Democrat Mark Warner outperformed the presidential lean of the state by 14 points, and the following year Republicans easily held onto control in the House. So why isn’t the Virginia election a good national barometer? First, one election is never a reliable barometer of much of anything — the same way watching one NBA game doesn’t tell you much about how the whole season will play out. That’s why, for special elections, I’ve been arguing that we need to look at the results as a group to get a sense where the national political environment is. Second, while most politics have become nationalized (people vote for one party up and down the ballot), governor’s races are still an exception. How else do you explain Republican governors in the very blue states of Maryland, Massachusetts and Vermont? Or the fact that Democrats control the governorships of Louisiana and Montana? 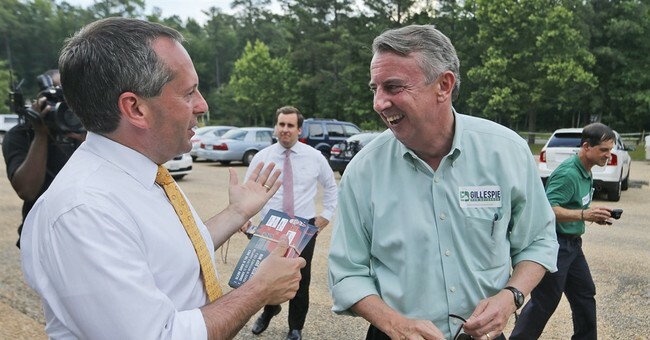 That being said, I’m still hoping for a Gillespie upset. There are hints that the Democrats are getting desperate, including a rather insane attack on Gillespie that he somehow has ties to white nationalism. While most polls have Northam up ahead, why are Democrats acting as if this race is close? Is there something in the internal polling that has the Northam camp spooked? In the waning days of the 2016 election, Barack Obama made a pit stop in Michigan. It seemed his people knew something the Clinton camp didn't; Trump won the state on election night. Right now, national Democrats are jittery about this race. Remember The Coast Guard Officer Who Planned An Attack On Dems? Here's Where Things Stand.